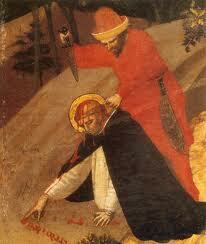 He murdered St Peter Martyr (St Peter of Verona) with an axe to the head. He was called a ‘minister of Satan’ by a thirteenth-century Dominican friar. Today, he is simply known as Blessed Carino of Balsamo (d. 1293). Apparently, killing a saint makes a good portfolio for beatification. It has worked out well for Carino. On April 6, 1252, Carino fatally struck St Peter Martyr in the forest of Barlassina some twenty-five kilometers north of Milan. Fleeing to Forlí, where he then lived and died, Carino spent centuries in Emila-Romagna before being translated back to Lombardy in 1934. Greater Milan’s wayward son now rests in the Church of San Martino in his hometown of Ciniseilo Balsamo just twelve kilometers north of the city. Pope Innocent IV’s 1251 appointment of Peter of Verona as the inquisitor of Lombardy was not well-received by the local sympathizers of Catharism, who immediately began plotting Peter’s murder. The plot was organized by a certain Manfredo, who hired Carino to do the dirty work. Carino, in turn, hired his own accomplice, Alberto Porro of Lentate. While Peter’s inquisitorial work was based out of Milan’s Dominican priory of Sant’Eustorgio, he maintained his role as the prior of the Como monastery, where he spent Easter in 1252. Carino likewise spent his Paschal holidays in Como, surveying the whereabouts of Peter, and when Peter and his traveling companion, Domenico, set off for Milan on Saturday, April 6, Carino’s ambush was laid and ready. The attack took place along the Como – Milan highway. Carino’s accomplice, Alberto, immediately fled the scene, leaving Carino to commit the double murder on his own. From Carino’s own testimony, he apparently attacked Peter first and then fatally wounded Domenico before finishing Peter off with a blow to the skull. Iconography generally depicts the saint with a knife in his head. For some unknown reason, Carino failed to flee the murder scene and was soon – and somehow – apprehended by a local farmer, who in turn handed him over to the civil authorities in Milan. Carino talked, providing an account of the attack and exposing the details of the conspiracy. Ten days later, on April 16, 1252, Carino ‘escaped’ from jail, fleeing south to Forlí. There, Carino was struck by what appeared to be a terminal illness. Spending in the hospital of San Sebastiano what he presumed were his last days, Carino made a full confession to the local Dominican prior. Rather than hand Carino over for prosecution, the Dominicans absolved him and received him into their order. Carino subsequently recovered from his illness and spent some forty years as a penitent lay brother of the Dominican order in Forlí before his death in 1293. 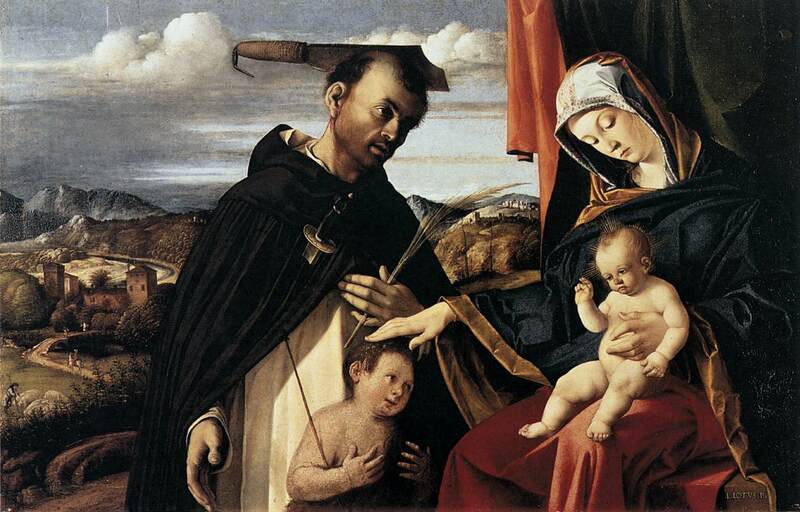 The image of Carino frequently appears in art dedicated to Saint Peter Martyr – depicted, as one may expect, as the brutal murderer rather than as the humble penitent. Save for a 1505 woodcarving in Milan’s Basilica of Sant’Eustorgio, which includes Peter and Carino among its representation of thirty-three Dominican saints, the two rarely meet as holy equals in the world of religious art, and the fact that an image of Blessed Carino is present in Peter’s home church – his tomb is in Sant’Eustorgio’s Portinari Chapel – is rather intriguing. And, yet, throughout the centuries, Carino has enjoyed a modest, though successful, cult of his own. In the sixteenth century, the Dominican gyrovague Serafino Razzi (d. 1613) compiled a Life of Carino, and in 1822, the Dominicans applied to the Vatican to have the cult regulated, but the paperwork was lost after the death of Pious VII (d. 1823). The Dominicans tried again in 1910. Finally in the twentieth century, the Forlí-based cult took root in Carino’s hometown of Ciniseilo Balsamo. 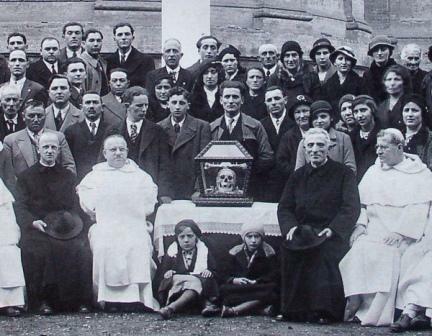 On April 28, 1934, lead by Blessed Alfredo Ildefonso Schuster, Carino’s head was solemnly transferred from Forlí to Ciniseilo Balsamo, stopping en route at the Basilica of San Domenico in Bologna, where Carino’s head was placed upon Domenic’s tomb and was venerated by the murderer’s new fan base. Carino was then carted off to Balsamo, where the town’s populus and religious and civil leaders received its son ‘with indescribable enthusiasm, coming with torches, candles and banners’. On November 4, 1964, the parish of Balsamo acquired the rest of Carino’s body. Heads and tails, Carino was now completely at home. And, so to speak, the blessed saint had finally returned to the scene of the crime.